Some months ago I shared the story of AlJ and his long struggle with heart disease. There is little doubt that without a heart transplant … well, let’s just say it didn’t look good. He got his transplant and has been been doing very well. Anything I can say pales in comparison to the following story. In short, there are always two sides to a transplant story. One is upbeat and encouraging. The other story is one of tragedy and nightmare followed by tough decisions. Sometimes, those timelines meet, like they did recently with AlJ & the donor family. I’ve long delayed making an update about AlJ. I saved the best for last. Please click and read this story. If we were having coffee today I’d admit I was a little depressed this week, because I’ve had a free promotion running all month and although it’s done okay, this promotion hasn’t been nearly as successful as I’d hoped. The truth is, I don’t, but I hoped to get a lot more people interested in my first novel so they’d be ready for the publication of its sequel this fall. Well, a debut novel is often a hard sell. Nobody knows who I am, and it is sort of a mixed genre. People get stuck in romance, mystery, suspense and … well, it has elements of all those things but mostly it is just a good story about a man who’s obsession is his own worst enemy. Everybody who reads it loves it. There are twenty-two good reviews on Amazon. I thought for sure I’d get a lot of downloads when it was free. I think it is because it is only free on one site … Smashwords. They are a premier self-publishing platform used by hundreds of thousands of independent authors. A vast percentage of ebooks come from Smashwords these days. Oh, I do. But they also partner with small publishers like mine. Smashwords converts ebooks into ALL available formats and distributes as well, to the likes of Amazon, Barnes & Noble, and iBooks. They sell direct too; they have a safe online store of their own. Registration is free and they don’t spam or sell info. They are very sensitive to that problem. They are a good deal for authors, too, because the royalties are higher. You’ve heard of cutting out the middle man to increase profits? Well, in this case, they are the middle man. They have a promotional period every now and then to spread the word about their own retail offers, and I decided to participate this time. I think people are a little timid to participate because they’ve never heard of it. It’s too bad, too, because there are thousands of free ebooks available at Smashwords this month, not just mine. I just hoped people would take advantage of this great offer to give my book a chance. All they need to do is just register and use the code SFREE and download the book … for nothing! It depends on what the user has. In their FAQ they have instructions for all the major ereader platforms. Well, the paperback isn’t free, but it’s available at Amazon, Barnes & Noble and Createspace. Free is always good … but the promotion only lasts until the end of the month. Time is running out. Someone once told me, “New authors can’t even GIVE their books away.” Well, I want to prove that person wrong and I need your help! For the next two weeks, my novel, THE FEVER, will be available as a free ebook download. It is available for all ebook formats. This deal ends July 31st. Don’t delay! If we were having coffee today I’d apologize for violating my own rule. You can see it right on my blog … where I mention that I’ll talk about a lot of things, but not shoes. But today, I’m sorry, I gotta talk about the shoes! Our daughter is getting married in a couple of months and my lovely wife is beside herself with preparations. The happy couple are both dancers and the bride expressed some interest in somehow incorporating her immense back stock of old, dirty, used, pointe shoes as part of the table decoration. If you didn’t know, ballet dancers save these shoes the way sports stars save memorabilia from their playing days. 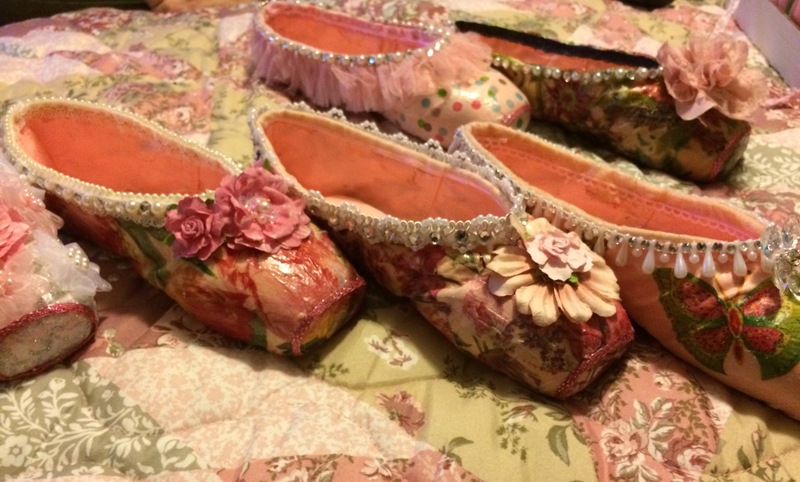 Pointe shoes are expensive and dancers grind these things into the floor, day after day, supporting their entire weight on one set of toes then the other, until … finally, the shoes, as they say, are dead, and they get tossed on the pile with the soiled, frayed, and spent remnants of their sister shoes. 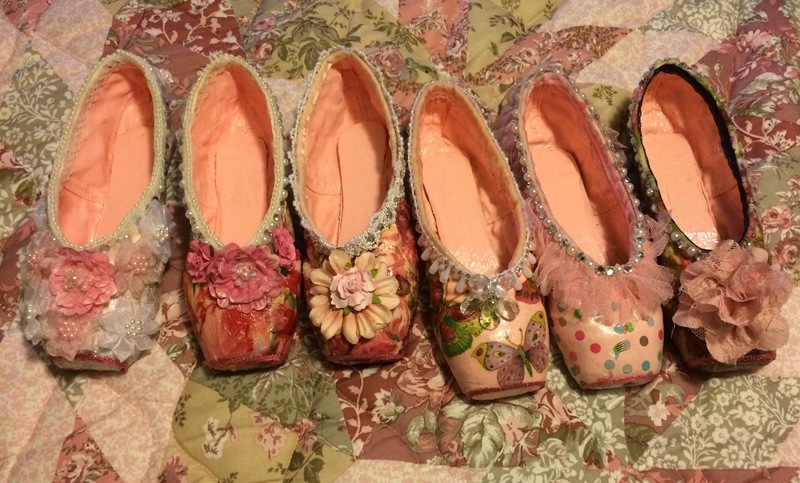 I have often been proud of my wife’s skill at crafts but I must say she has outdone herself this time … enacting a most remarkable transformation on these pointe shoes. I was absolutely gobsmacked when I saw the first one and they keep getting better and better. They will ultimately be displayed upright in a vase as part of the centerpiece for each table at the reception. 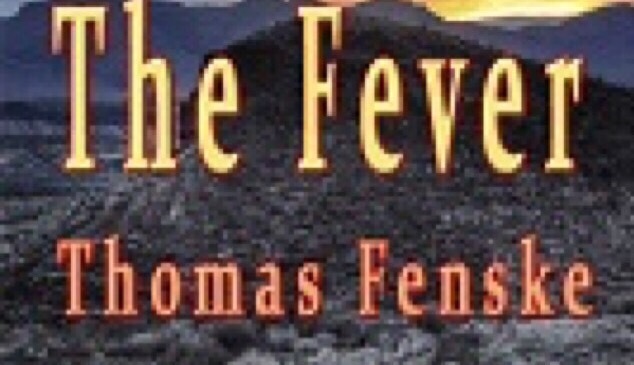 Thomas Fenske is the author of The Fever and the upcoming release of A Curse That Bites Deep. If we were having coffee this morning I would tell you about having a déjà vu moment at the vet’s office the other day. Well, it wasn’t really déjà vu I guess. One of the assistants felt compelled to tell me a fact about cats. Of course, having one of the people at the vet’s office mention some fact about animals doesn’t seem that strange, but this one fact, worded in that exact way, was something I myself had said in that very office a while back. It had to do with my cat, who has a chronic urinary tract condition. The fact? The original wild cats our domestic varieties came from were primarily arid-climate cats who got most of their moisture from the food they ate, so it is best to feed cats wet food. Oh, well, borrow from the best. It’s true, by the way, but somebody needs to tell the cats, as a lot of them love dry food. I think it is the crunch. This one in particular loves dry food and simply doesn’t understand why he can’t have it. A further complication is that I have a huge pile of cats in my house (I know, I know, a clowder) and I almost have to intersperse a little dry food among them to keep costs down … but not for him, at least in theory. In fact, I know a lot of things about cats, some I’ve read, some I’ve experienced. Like going back to the original cats, did you know that among all the domesticated animals, they were never really selectively domesticated from the wild? That’s true. They just sort of showed up one day, liked the place, and decided to never leave. Sure, there has been some selective breeding and such since then, but originally it is thought when grain was first being cultivated and stored it drew droves of vermin and the cats followed the vermin. It turns out they found us useful to have around so they kept us. Then there follows another remarkable cat achievement. Meowing. Adult cats do not meow to each other. Oh, they purr, they hiss, they growl, they caterwaul, but meowing? Kittens do it, but as a pretty fixed general rule, adult cats don’t, at least not to each other. That’s for us. They talk to us and it is my theory that they learned inflection in their voices by listening to us. Those unmistakable questioning meows, or the emphatic, or the gentle loving tones … those are all for us, communicating to us in the ways they’ve learned … from listening to US talking to them. Here’s another fact: did you know cats won’t bounce on a trampoline? I think this is related to their much revered self-righting ability. I had one of those jogging trampolines and found out that if I dropped a ten pound cat from three feet, he landed it like he was Mary Lou Retton completing the parallel bars. I dropped ten pounds of newspapers from the same height and I was picking up newspapers for five minutes. I wasn’t trying to be cruel, but once I experienced it once, I had to test it a few times … I mean, it was obviously not harmful, it was not anything. They drop. They do not bounce. Remarkable. They are capable of a lot intense body manipulation … like changing their momentum in mid jump. I’ve seen them start to jump toward something, change their mind in mid-flight, and land on the floor instead. One day I was relocating a misbehaving cat to the kitchen for some down time and dropped him two feet to the floor just inside the kitchen doorway. Within that two feet he did a complete 180 in the air before he hit the floor and was outtathere. You know how graceful they look when they jump up on something like a table? If you look at them closely, as they jump up they re-position the front half of their body to carry their momentum from vertical to horizontal, essentially first up to, then over the table, bringing the rest of their body along the change in vector. Their spacial awareness is good too. Sit with your legs slightly apart and watch when a cat jumps up into your lap …they’ll spread their front legs/paws to meet the width of your legs. They don’t look down as they do this, their little pea-brain computers have already done the calculations as they completed the aforementioned arc transformation. Darn, coffee’s cold. Let’s get another cup and talk about something else. Awesome! Thanks, Kristin. Reminder to new readers, she has a link back to her recent review of the book. Catch The Fever! Author Thomas Fenske is participating in a freebie at smashwords.com this month. For the month of July, all e-book versions of The Fever are free at Smashwords. Read my review from the end of May – it’s definitely worth giving it a read! When you give it a read, please stop by and let me know what you think! The ebook is free right now but THE FEVER won’t be free forever, so take advantage of this special offer. If we were having coffee I’m afraid I’d be inclined to perhaps pay a little too much attention to what you were having. We humans are funny about our perceptions of what we spend money on. We’ll think nothing of dropping upwards of five bucks or more on a Mocha Latte with an extra shot, sometimes every day. Sometimes several times a day. Look at smokers. To them the cost of cigarettes is a given. It’s automatically on the top of the pile. That’s why you see so many panhandlers who smoke and it is no doubt a part of what keeps them on the street. The first five bucks is not going to go to booze, as you might imagine, it’s going to go to tobacco. Maybe the second five bucks will go to booze. Like any artist, an author spends hours, days, weeks, months, and sometimes years sweating over their work. It’s not just books. I’ve seen people balk at the notion of buying music too, usually complaining while enjoying a high-priced coffee drink. Don’t get me wrong, I think ebooks should be cheaper than print books and their value should reflect the resources they save. It is an immense savings, so on the other side of the issue … when I see an ebook priced as much as a print book I wince. “Overpriced ebooks are part of the problem,” I’d say after another sip. Since I got my first electronic reader, I’ve read more books than I’ve read in years. I won’t bore you with the brand, but it’s true. The trick I found is a good case, one that opens like a book, and feels like a book in your hands. I went with a bigger screen once but down-sized because I think a smaller size is more comfortable for reading. There is back lighting for dim light and you don’t have to fold down pages if you forget your bookmark. Email, web access, movie streaming, yeah, there is extra value there, sure, but I always go back to the books. Of course, if you’re read any of my blog entries, you know I have my own book out there. “Yeah, me and everybody else,” I’d joke as I took another sip. It’s in both print and ebook format. I’ve probably sold just as many (or maybe I should say just as few) copies in one format as the other. I make a little less on the print books even though they are $13.95 and the ebooks are $3.99. Voodoo economics I guess. After you purchased us each another muffin, I’d tell you the news. And then I’d react to your startled look. Thomas Fenske is a writer living in North Carolina. For information on his book, yes, the free one, check out his web page. Next week, you’re buying the coffee.